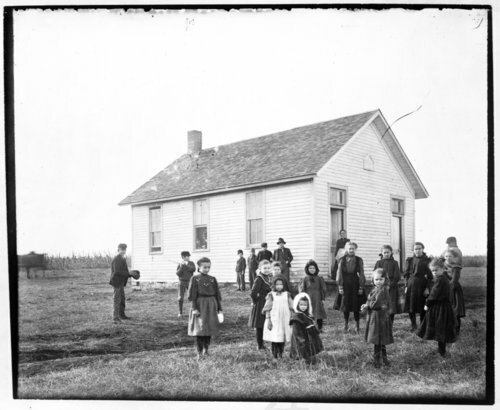 Photograph of students playing in front of Knapp School in Wabaunsee County, Kansas. The first school in District 55 was started in the home of Mrs. Lloyd A. Knapp, so when this building was constructed it was named in her honor. This building was destroyed by fire on December 11, 1930. Some of the girls are identified as Lagardia Boyd, Sarah Knight, Gertie Boyd, Carrie Cowdrey, Hazel Knapp (b.1902), Emily Knapp (b.1899), Ione Boyd, Ethel Knapp (b.1896), Esther Logan, and Josie Knight (on the left).